In battling David Norris’ claims that Irish homosexuality laws were in breach of his human rights, the government was considering all kinds of defences. TODAY, DAVID NORRIS is one of the best-known politicians in Ireland. Certainly one of the best known Senators. That has been the case for many years. In 2016 he stands as one of the most prominent gay-rights activists in the State. 30 years ago, he was in a legal fight for his human rights with the government of the day. And that government had some no-holds-barred ideas when it came to preserving the status quo, according to papers released under the 30-year-rule by the National Archives. Norris’ case was on the surface a simple one – essentially, in Ireland it wasn’t illegal to be a homosexual at the time. It was, however, illegal to commit ‘certain homosexual acts’, including ‘buggery’. Norris, represented by one Mary Robinson, argued that this was an infringement of his human rights. The case was first taken in 1977, before progressing to (and being dismissed by) the Irish Supreme Court in 1983. So the Senator took his case to Europe. Specifically, he alleged that Irish law violated Article 8 of the European Convention on Human Rights – the right to respect for one’s private life – and that in doing so he became a de facto victim of discrimination. From the get-go, the government knew legal precedent was not on its side. “A finding against the Government seems unavoidable,” one Department of Foreign Affairs (DFA) memo from November 1984 said. There is no material available to show that the laws are “necessary” to protect health, and all arguments on their necessity to protect morality failed in the Dudgeon case. Duty-bound to uphold Irish law it may have been, nevertheless by modern standards it seems a little odd that the government, which for the time was generally seen as progressive in its outlook, was so committed to defeating Norris on the issue. 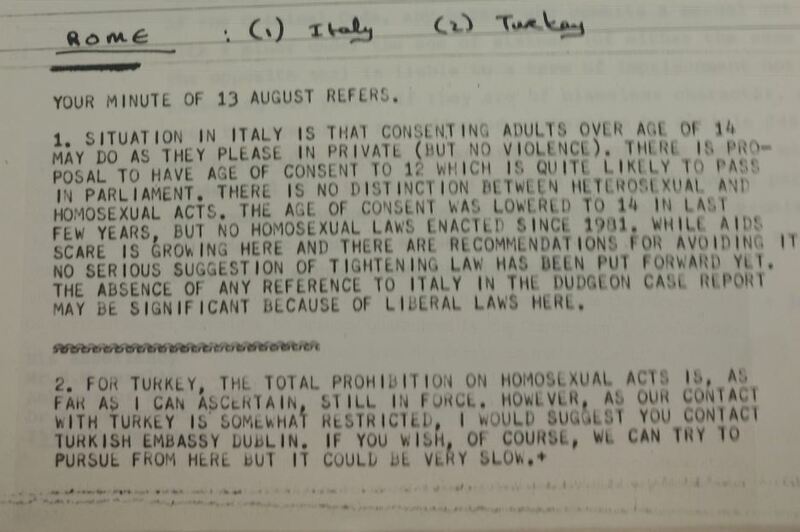 The Dudgeon case referred to here was a similar trial taken to the European Court of Human Rights (ECHR) in 1981 by a gay man, Jeff Dudgeon, in Northern Ireland. That case was significant as it was the first such regarding homosexual rights to be taken to the highest level in Europe. In ruling in Dudgeon’s favour, the court set the precedent that would see discrimination against any aspect of homosexual behaviour eventually ruled illegal in all member states. 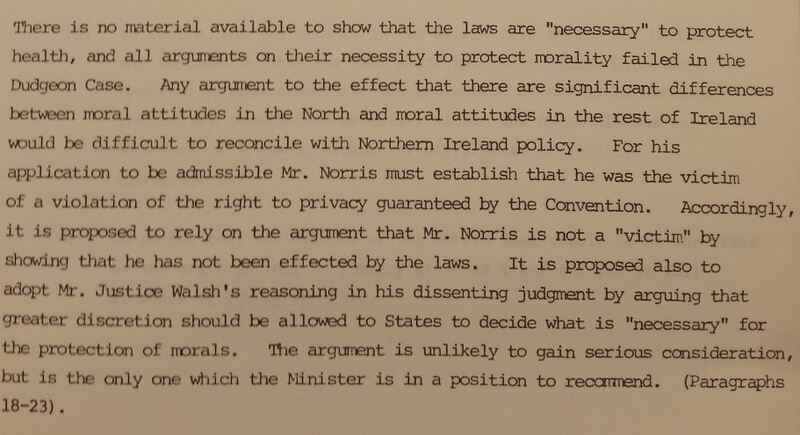 The Dudgeon finding meant that precedent was in Norris’ favour, though aside from the argument of discrimination there was little else in common between the two cases (Dudgeon’s related to his interrogation at the hands of the RUC in 1975 concerning his sexual activities). “On 27 August the Washington Post reported that a federal appeals court in New Orleans upheld a Texas law banning homosexual activity and making the private sexual lives of more than 700,000 Texas homosexuals illegal. I will try to obtain a copy of this law and, if successful, I will forward it to you,” read an August 1985 response from the Washington embassy. 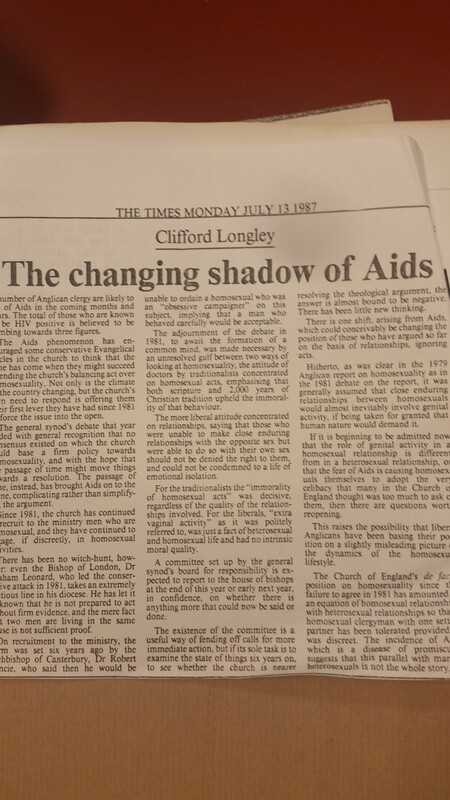 Assessment of the case as at 9 October 1985 with reference to the question of raising Aids in the defence. Terms of Government decision of 10 October 1985 deciding that subject to certain consultations between the Ministers of Foreign Affairs and Justice the issue of Aids should not be raised in the defence. Following consultation between the DFA and the Department of Justice, it was decided it did not make sense to do so. The case would eventually be decided in Norris’ favour by the ECHR in 1988. The Irish legislation outlawing the crime of ‘buggery’ meanwhile was repealed in 1993. Email “Government considered using 'AIDS argument' in David Norris gay rights case”. Feedback on “Government considered using 'AIDS argument' in David Norris gay rights case”.